Nani Waddoups has more than two-decades experience as an entrepreneur, and that doesn’t even include her past six years running a private therapy practice in Portland, OR. As a seasoned small business owner and a professional counselor, QB Community member Nani is uniquely positioned to offer up self-care strategies for staying centered and grounded -- something particularly important for entrepreneurs working around the clock to build a successful business. As Nani explains in this profile, the high-tech age we live in has created not just connection, but, for many of us, a sense of over-connectedness. The dot in “Red Dot Syndrome” refers to the notification icon alerting us that someone or something needs our attention. Nani points out our addiction (yes, she uses this word deliberately) to instantly responding to anything and everything is disruptive, to say the least. To combat Red Dot Syndrome, Nani believes we all need to create (and protect) uninterruptible time to be tech-free or otherwise “off the grid” every single day. After all, she explains, in order to give the Self what it wants and needs, first we have to tune in to that Self – which requires tuning out a whole lot of other noisy, distracting stuff. In her private practice, Nani takes the inherent pleasures and health benefits of being outside to a new level, offering “walking” therapy as one of her client services. She finds people often feel more relaxed, open and attuned to their thoughts and feelings when they’re out on a trail. Nani recommends we all do some daily “forest bathing” to boost our concentration, creativity and energy. I regularly revisit why I do this work by reciting a quote by Pema Chodron: We don't set out to save the world; we set out to wonder how other people are doing and to reflect on how our actions affect other people's hearts. QB Community members, what are your strategies for daily nourishing your mind, body and soul so you can always be on top of your game? I’ve been self-employed for most of my career as content specialist, so I know how much discipline and determination it takes to run your own business. 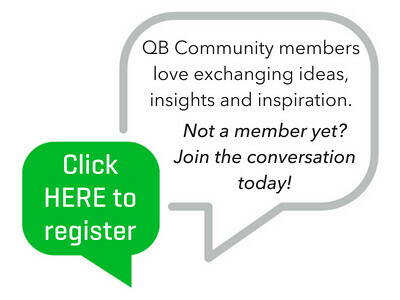 As QB Community Content Chief, I love sharing the stories of people committed to doing things their way. I hope you’ll join our community and share your inspiring story! @PDXGardinista - I, too, get so much more from "forest bathing" than a simple walk in nature. Being outside, away from modern worldly concerns, feels like the equivalent of washing my soul (like washing one's hands). The feeling I get when I exit that environment is pure invigoration and I am renewed to handle the tasks at hand, that do often feel like they're ever present. Thanks for your wisdom! And for finding clever ways to connect your thoughtful practice with the practice of doing good business.